I remember the first time I went over to my friend’s house to watch her 60” TV. It was the mid-90s. The excitement, the outright jealousy; it was all-consuming! And then I got there and realized that this so-called TV was a hulky mass – an ugly monstrosity consuming the room. Sure, it was fun to watch ABC’s TGIF shows on a TV that size, but talk about an eye-sore! Fast forward to today’s slender HDTV and tomorrow’s even thinner OLED TV. These are much more attractive, take up far less room, and provide a much clearer picture, but present a very different design challenge. A lot has been written on the technical differences between plasma versus LCD or 1080i and 1080p. But, is your 60-inch flat screen fantasy TV the right size for your living room? And where should you put it – on the wall or on a media center? With Christmas on its merry way, many of you out there can expect to receive a surprise TV from a loved one or friend (I think I need to find different loved ones – all I’m getting are tube socks and a calendar!). Here are some helpful tips so you can make the best use of that fancy TV and transform your living room into a neighborhood hangout! 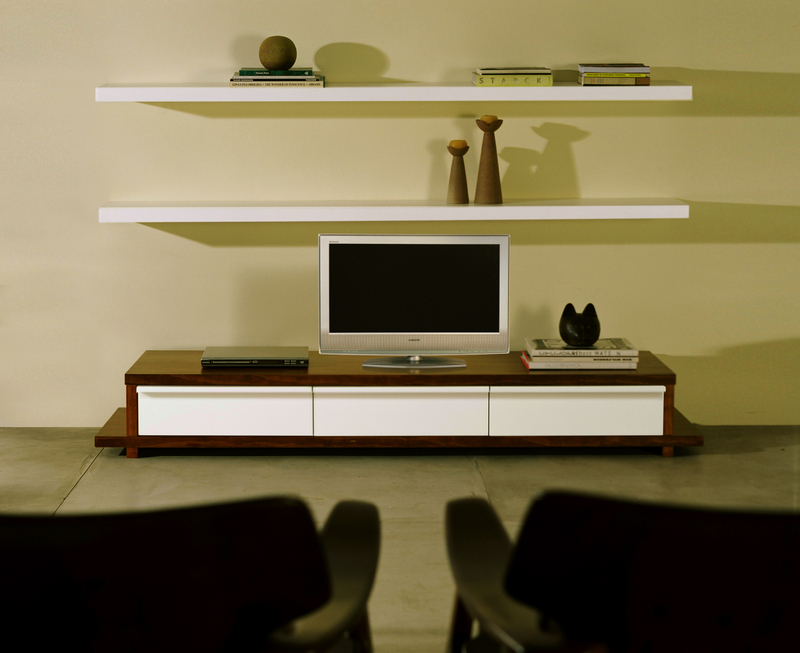 1) As a focal point, your TV should be in proportion to the room size and all the furniture contained within. Contrary to the mid-90s oversized TVs, the new, slender models should never dominate the space unless you are creating a separate screening room or starting your own personal sports bar. 2) Too large a picture or sitting too close will cause major eye-strain and headaches. When sitting down, the middle of the screen should be at eye level. “Matching a media center to the size of the TV is overlooked but it is so important,” cautions William Oliver, one of Brastilo’s esteemed furniture designers. “Hang your TV correctly or choose a media center whose height will put you directly in the middle of the picture”. Don’t make the mistake of placing it too high or over a fireplace mantle. This will only cause neck pain! 3) It’s also important that you have the right-sized picture for where you will be sitting relative to the screen. As a guideline, when viewing wide-screen sets, you can sit as close as 1½ times the screen’s diagonal measurement without noticing a loss in picture quality. But don’t go too far into the nosebleeds - sitting more than 3 times the screen size means you’ll more than likely miss out on the immersive feel of the program. 4) After all this painstaking effort to get the perfect view of your television, don’t forget to minimize glare. Make sure you consider the location of your windows relative to the placement of your TV. Media centers with wheels can help you make minor adjustments as the sun moves throughout the day. We hope these tips were helpful! Now you can fully enjoy the next episodes of “Larry King Live”, “Charlie Rose”, or “A Shot at Love with Tila Tequila”.